Was I surprised? To be honest, not really. Generating ideas, outlining broad directives, and publishing finished stories has been a part of my career (and life) for over 15 years now. Much of this has become routine and a bit formulaic to the extent that intuition just kicks in and takes over. Additionally, I have a great time thinking creatively and injecting memorable moments into day-to-day marketing efforts. To generate good story ideas, kick-start the process with a simple formula based on your current audience and Buyer’s Journey (read: Healthy Marketing Habits). Remember, we already have “the challenge” outlined for us. Spend a few minutes brainstorming. Write down all ideas and leave space to review and insert notes. Spend a few minutes developing initial and relevant questions. First thoughts are important. They surface to the top quickly (no snorkeling pun intended!) because of your intuition. Trust it…then verify (next step). For each idea ask about the audience, the Buyer’s Journey location, a link to past content. Questions will begin to surface that are unique to each idea. Then quickly spend some time researching and answering questions that come up. Who is the expert in your organization who can confirm an assumption? What customer input do you need for thought leadership? Is that customer available? Answering questions might also modify or introduce new ideas to the brainstorm. It’s OK to add more story ideas during this process. Finally, draw a conclusion and make a decision. This is the start – outlining the story – so draw a conclusion and decide which direction you want to take this project. Now get to work! Adjustments will be made along the way and that’s expected. No paralysis by analysis here – trust your gut and go for it! In today’s hyper-noise-filled space, creating stories that resonate with your audience along different points of their Journey is necessary. Stories communicate. Tell the right story to the right people and you will capture attention and enlighten the audience. Along the way, you can also persuade and entertain. Do this right and your reader will remember, and maybe more important in today’s world – they will share your story with others. 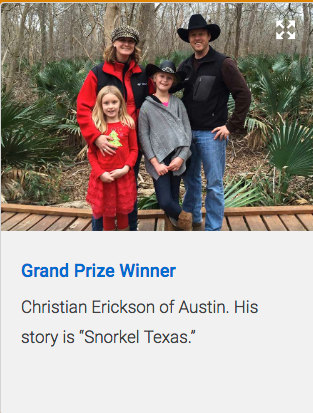 Thanks for celebrating this small win with me and Hill Country Advisors. Contact us today for a conversation about your marketing needs and to get started with our own brainstorming session. Congratulations on your win! These steps could well be the four steps to success in any area of life. It helps to see every marketing project as a 250 words or less or challenge. Paralysis by analysis is an obstacle that I have faced many times and I know I must trust my gut instincts; your four steps make it easier to do just that. Nice and concise Christian–thanks for this encouraging reminder. I’m saving your bullet points as a resource and will refer to them as a guide moving forward. Additionally, congrats on the win! As we all know, everything is bigger in Texas and this was a nice win for you.